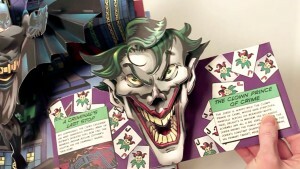 Matthew Reinhart is best known for his advanced and outstanding paper engineering. But it goes beyond that. Much further. Reinhart is an artist with the mind of a curious child. If you’re smart, you choose to study and become a Biologist or Doctor. If you’re brave, you follow your heart and trust on your talent. And that’s exactly what Matthew Reinhart did. His motto “Life is too short so do what you like best” he translated into the realization of his dream: creating art. The work of Reinhart, of course, needs no introduction to collectors. He takes a lot of inspiration for his work from his passion for Transformers, StarWars, dinosaurs, comics and street-art. Because he can empathize effortlessly with the imagination of a child, Matthew knows how important it is to make exciting books for children. 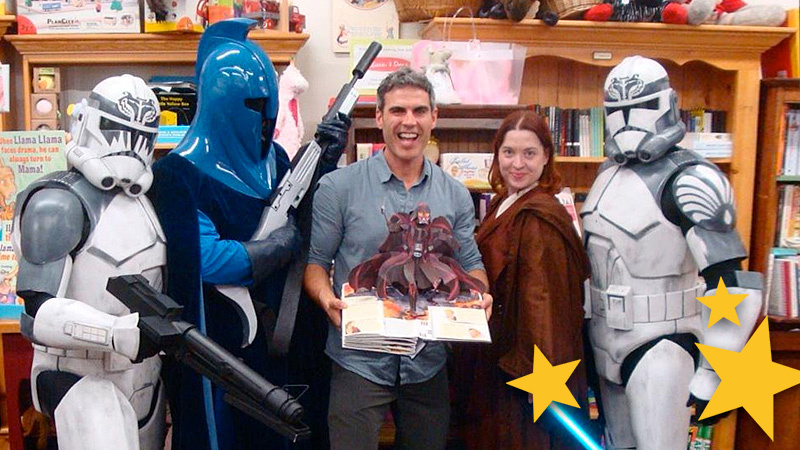 With his impressive portfolio of published pop-up books, his goal, to motivate kids to read more books, is more than achieved. Seen from the artistic side, his way of working is precise, technically but particularly creatively. As he mostly makes his own artwork, he does not choose the easiest way, but the much more time consuming aesthetic way. With a precision knife and a cutting mat as a tool, he makes beautiful pieces of art that form the base of his pop-up designs. All pop-up elements are carefully cut out of the hand-painted textures and formed into a colorful collage. By using his computer as little as possible, he retains the “craft” look of every design with an extreme focus for detail, all done by hand. A time-consuming process which he has mastered, that results in that typical and recognizable Reinhart look and signature: Artistic, vivid and pure. 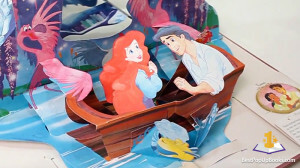 The work of Matthew Reinhart was our first introduction to modern pop-up books. 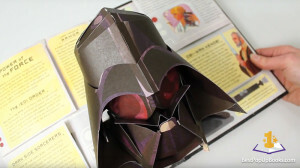 The impressive Transformers A Pop-Up Guide to the Galaxy was our main reason to buy (collect) more pop-up books and explore the field of sophisticated pop-up books. We therefore think it’s a great honor to interview Matthew Reinhart. In this interview, Reinhart talks about his hobbies, his studio, his disciplined and dedicated way of working, upcoming books and he also gives us some insights in how the most complicated pop-ups have been established. 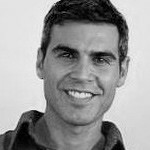 BPUB – What are your personal interests besides pop-ups and paper engineering? MR – This is the kind of question I like! Off to a great start! I love to talk about pop-ups, don’t get me wrong, but I have many other interests/passions/obsessions in my life, too. Many already know that I am kind of a comic book and science fiction nerd. Star Wars is at the top of my list – it always has been since the first time I saw it in 1977. Not only have I seen all the movies countless times (even the prequels), but I’ve read all the books/comics, watched all the animated shows, and collected almost every 3.75″ action figure since 1978 (by the way, there have been something like 2000 different Star Wars figures made since then). Now with a new series of Star Wars movies and stories ahead (yes, I loved the new movie), I am a very happy camper. While I love DC Comics and Marvel super heroes, my other favorite besides Star Wars is the Transformers universe (mainly cartoons, comics and toys – not so much the Michael Bay movies). I’ve been a Transformers collector since their introduction back in 1984 – and never stopped! Perhaps the complicated puzzle-like aspect of transforming each robot into its alternate mode sparked my interest in paper engineering? Who knows? I’ve actually a recently become interested in urban street art, which is often gets categorized as ‘graffiti’ – it’s so much more! Whether a giant commissioned mural or a graffiti artist’s tag, it’s art that appeals to everyone, tells a new story, beautifies harsh city environments even though it may not last forever. Also, over the last few years, thanks to my husband AJ, I’ve become much more interested in modern and contemporary art. Along with my bookish interests in zoology, paleontology and world mythologies, I’ve a keen interest in ancient history. I exercise daily – weightlifting, biking and running. Being physical keeps a crazy artist like me moderately sane! Any family time, especially with my niece Lillian, my nephew George, is cherished above all else. BPUB – You’re known for your advanced and groundbreaking pop-up designs. Do you see it as a challenge to raise the bar for yourself and other paper engineers? MR – Thank you very much for the kind words and for appreciating the evolution of my paper engineering work. When I am creating a book, I don’t at all intend to challenge anyone or raise the bar at all – I just want the work to be good, different and interesting for myself. Admittedly, my engineering skills have advanced quite a bit since I first began. After forty or so books in about a career of over 15 years, though, that tends to happen. New engineering ideas, whether they succeed or not, keep things interesting for me and the readers. Recreating the same mechanisms over and over would bore me to tears! I believe an artist’s should always be evolving and changing. BPUB – During your career as a paper engineer, which pop-up was the most fun to work on and which was the most frustrating? MR – Every book has parts that are fun and frustrating, so it’s hard to say. 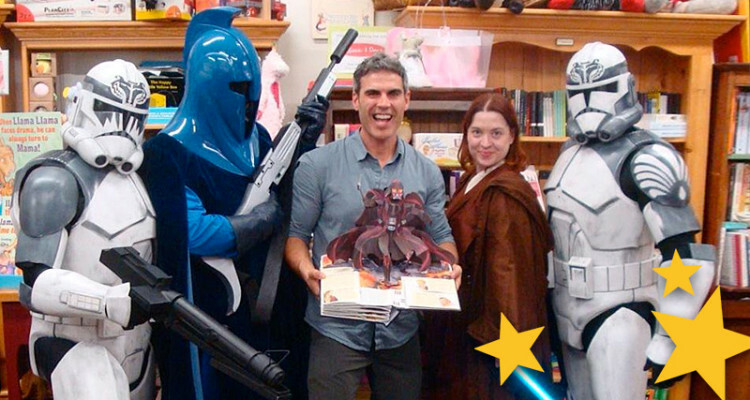 I’m not sure I could pick a book that was the most fun, for example, many would say my first Star Wars book, Star Wars: A Pop-Up Guide To The Galaxy, would have been non-stop joy, but it was far from it. I am a terrible critic of myself and I wanted that book to be as perfect as it could be. So it was equally fun and frustrating. The same went for my upcoming LEGO POP with Scholastic that releases Fall 2016; while I loved creating the initial pop-ups and all the artwork, there were countless revisions that needed to be made, and then revised again. Thankfully, the wonderful folks at LEGO are very detail-oriented (even more than me) and were extremely helpful with getting every brick just right! The end result will be pretty spectacular, even if I do say so myself. BPUB – Some of your books are known for their impressive pop-up pull-tab transformation techniques. Can you tell us more about this technique and how it has evolved to spreads like Optimus Prime in the Transformers pop-up book and the Little Mermaid scene in the Disney Princess pop-up book? MR – Well, I’ve always been interested in representing transformations in storytelling, whether they were characters’ transformations or whole scenes changing. I started years ago cutting little windows into flaps, so that readers could see a flattened pop rearrange into another pop-up structure. My Transformers: Pop-Up Universe was years in the making, thankfully, so I had plenty of off-time creating transforming pop-up structures. I mean, what would be the point of creating a pop-up about Transformers if the pop-ups didn’t transform? I created countless designs – many more failures than successes, I’m afraid – and got inspiration from other pop-up artists like the unrivaled Robert Crowther (who created books like Amazing Pop-Up Trucks). I didn’t borrow directly from his work, but it helped push me in the right directions and learn what could be done. In making a transforming pull-tab pop-up, there are a lot of factors for which one needs to account. Two primary structures need to incorporate less complicated mechanisms so that they can fold away with a simple yet satisfying pull/push – the fact that the whole structure can transform AND fold flat is complicated enough! The pull-tab mechanism needs to sturdy and placed in an accessible place. Most importantly, the transformation needs to fit with the storytelling, which I believe is illustrated well in Disney Princess: A Magical Pop-Up World. 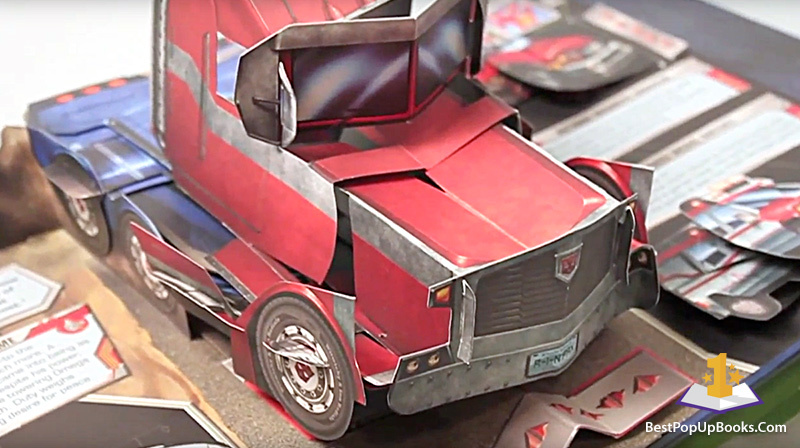 I took all the new things I learned from creating the Transformers book and used it to advance my pop-up storytelling. 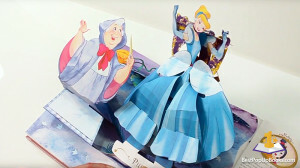 Whole pop-up dimensional scenes change around a specific heroine helping to advance the story and her development. It’s funny to think that the pop-up for the Cinderella’s magical ballroom makeover drew its inspiration from the paper mechanics that made a truck shift into a giant robot from outer space! BPUB – How was it when you first saw the complete Transformers pop-ups, combined with the artwork of Emiliano Santalucia? MR – I was blown away! First of all, he creates the art so quickly, and it’s all so accurate, sharp and clean. Plus, he followed my initial rough guide sketches perfectly which making them 1000 times better. BPUB – How does it feel that your work is represented in a lot of Transformers and Star Wars fan collections worldwide? MR – Very lucky indeed! To be a tiny part of such wonderful universes makes me a very proud fanboy. 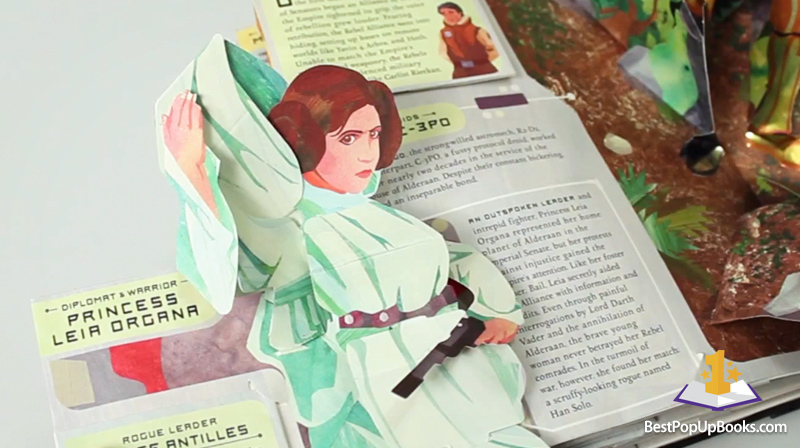 BPUB – We’ve noticed that most of your pop-up books contain a giant pop-up. Are you secretly trying to break your personal record of engineering the highest pop-up ever in a book? MR – Well, it wouldn’t be a secret if I told you, would it? I guess I always include big pops because I’m from the United States and we like everything big here! Seriously, though, I try to fit the pops to the content or story. Sometimes I make things gigantic because it’s fun to make a structure that will surprise readers. BPUB – We can not imagine how disciplined you have to be to be able to work on multiple pop-up book projects per year. How do you and your team manage to do that? MR – I am a hyper-focused individual. It’s who I am. I also really enjoy making these books. Work is hard, but a pleasure. There are days I don’t want to get tired, eat or leave the office. I am THAT into my work. It isn’t always easy to have my attention divided between different projects but it keeps my mind nimble. And these days, I don’t really have a full-time team, only part-time helpers. While I love collaborating and employed several full-time designers in the past, the pop-up book business changed a few years ago and I was no longer able to maintain a team financially. While my business has vastly improved, my needs as an artist changed. Being a supervisor of a full-time team distracts me from my work and at time restricts my creativity. I often like and need alone to work uninterrupted in my work studio. Such a difficult artist I am, right? BPUB – When you work on more than one pop-up book at the same time, do these projects run simultaneously? MR – It depends. Sometimes I can work on a smaller title during the progress of a larger book, and I’ll just allocate certain days of the week on each title. It is not an ideal situation for me – and helps if I have a helper who can implement my designs while I work on something else. I would rather devote all of my creative and analytical energy toward one book at a time. BPUB – Do you think it’s important to share your knowledge in paper engineering with the next generation paper engineers? And what do you suppose is the best way to do that? MR – The best way to share my knowledge to the next generation is to teach and work together directly, I think. I really enjoy teaching when I am not under terrible deadlines – it’s a wonderfully fulfilling experience. Students often teach me more than teachers do – they aren’t wrapped up in rules and restrictions. BPUB – Who is your favorite (new) rising paper engineer from whom we can expect a lot from in the future? MR – That’s a tough one! One of my most recent assistants, Becca Zerkin, is always surpising me – her Walking Dead book was incredible! As well, many of my other past assistants – Yevgeniya Yeretskaya, Kyle Olmon, Jessica Tice, and Sam Ita – all make incredible work, though most of them are already pretty well-established in their own right. Robert Kelly is probably doing some of the most innovative and inspiring paper engineering these days, and has even gained the incomparable Ellen Rubin, known to the world as The Pop-Up Lady, as his most vocal fan! BPUB – What do you think of the indie pop-up book publications on crowdfunding platforms like KickStarter? MR – I love them and contribute to making them a reality when, of course, I know about them! I am a fan and owner of both Pop-Up Art Books by Rosston Meyer. I hope to one day collaborate with him when I have the time in my schedule. Rosston is making the pop-up books he, his supporters (like me), and art fans want, without the restraints of mainstream publishing. He’s a taking pops into new territory – a true pop-up pioneer – and I love it. BPUB – We have to ask, what’s your favorite Robert Sabuda pop-up book? MR – I have a lot of Sabuda favorites, actually, and, in my opinion, he’s the one of the most talented paper engineers ever. His most brilliant works are his classic adaptations including Alice In Wonderland, The Night Before Christmas and The 12 Days Of Christmas. BPUB – Could you perhaps reveal anything about the new LEGO an Frozen pop-up books your working on at the moment? MR – What can I reveal? Hmmm. My publishers are always block me from saying too much too soon. They are both MONSTER books, a pop-up feast for the eyes and the mind! Both titles release this fall, LEGO Pop first and, then a month or so later, Frozen: A Pop-Up Adventure. Both titles really pushed me artistically, especially in regards with creating color artwork. Frozen incorporates several really fun, interactive (i.e. pull-tab pop-ups) storytelling mechanisms. Oh, yeah, and the LEGO Pop actually has a triple changing pop-up. How’s that? BPUB – Did Insight Editions already ask you to think about a 30th Anniversary Edition pop-up book about the Simpsons? Wouldn’t that be great to create? MR – I do believe I had a chat with the wonderful folks at Insight about making a Simpsons 30th Anniversary Pop once. Sometimes, many factors keep projects from happening unfortunately. Funny thing is, I had wanted to create a Simpsons pop-up for a very long time (I’ve been a fan since the Simpsons showed up on the Tracey Ullman show) and even had an assistant mock-up a rough prototype for the Simpsons folks over a decade ago. Nothing ever came of that either, and that’s OK. Now, if you are friends with Matt Groening and want to put in a good word for me, please feel free! BPUB – What do you think of bestpopupbooks.com and the idea of a platform just about pop-up books. Do you have any feedback for us? MR – I think it’s a brilliant site – unbiased, content-filled, current, modern and accessible. I’d be happy to contribute as often as I can in the future! We would like to thank Matthew Reinhart for his cooperation with this interview!